My grandmother told us that The Boogie Man was in her sewing room to dissuade us from going in there. There was also a radiator build into the wall in her bathroom with a little door that you could open to turn the valve. She told us he was in there too, which led to me (and one of my cousins I later found out) sitting sideways on the toilet so that I would be as far away from the radiator as possible. Wasn’t aware he played for the Red Sox. I think I have a ’73 Topps of him on the Tigers. As a kid, it seemed as if that Tiger team had been together for ages. Kaline, Freehan, Norm cash, Ed Brinkman, A Rodriguez, Lolich, etc. Sure enough, by ’75 or so, they were all gone. I wonder if the Red Sox were hoping McAuliffe could bring a little pop to the second base position. McAuliffe probably seemed as if he’d be an upgrade over Doug Griffin, but the last of his many good years at bat occured the year before he arrived in Boston. He was quite a rare commodity in his heyday though, a good-fielding second baseman with a powerful left-handed bat. Not too many of those in baseball history (three of the five I can think of, including McAuliffe, played for the Tigers–Charlie Gehringer and Lou Whitaker being the guys who preceded and followed McAuliffe in Detroit, Joe Morgan and Chase Utley being the others–Nellie Fox and Eddie Collins don’t quite rate in this list because they never hit many homers). I guess McAuliffe wasn’t quite in the class of those other guys, but he’d be a useful guy to have around nonetheless. He has kind of a uni-brow going on there – no Wally Post or anything, but it seems to be present. I think the most unique thing about McAuliffe was his goofy open batting stance. His chest was pointed almost directly at the pitcher. It was always fun to try and impersonate his stance. And like Soundbounder, I didn’t realize he was also a Red Sox. I only knew him as a Tiger. For a long time McAuliffe was the all-time leader in home runs for players born in Connecticut. This was before Bagwell and his steroids blew that record out of the water. shealives: Interesting about the Connecticut record. I would have guessed that Mo Vaughn would have passed McAuliffe before Bagwell–wasn’t Mo from Connecticut? I remember McAuliffe as having the most open batting stance I’d ever seen, even more than Luis Gonzalez a few years back. Little Mac held the bat up with the knob pointed at the picture like he was ready to club him to death if he threw one too inside. Then he’d pop a little fly up into the overhanging Tiger Stadium deck, grandstand interference if there ever was such a thing, and he’d scamper around the bases like the unibrow gnome that he was. If sabermetrics were around back then, with all his guaranteed yearly on-base he would have been their poster boy. The difference between the ’74 and ’75 sets is indeed striking. ’74 had one of the most conservative looks and ’75 had the full-blown, gaudy ’70s thing going. Damn Josh. I’ve probably read 75% of your posts, and that is some of the best writing yet. Your comparison of those ’74 cards to hanging out in the toyless room, and so forth, was great. This is probably my favorite entry yet. @polfro, that’s it in a nutshell. 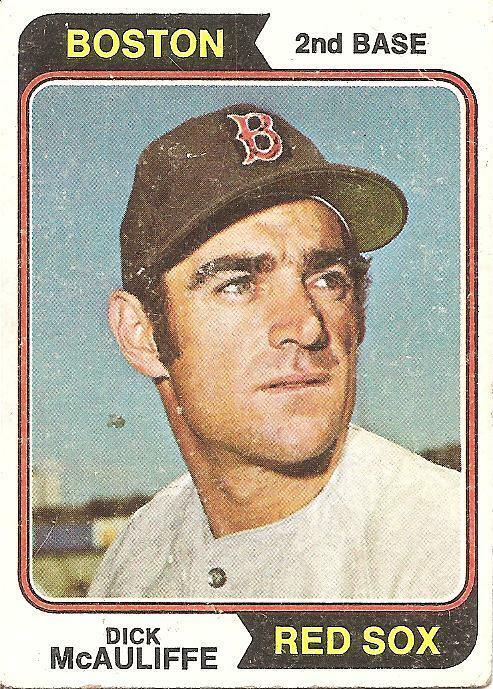 He played in the 60s when batting avgs were depressed, so since guys in that era were judged by their triple crown stats, he wasn’t as heralded as he would be now — good fielder, pretty good power, excellent on-base guy. I got my first glove when I was 8. Rickey Henderson, who played until I was almost 30, was the autograph. My second, and still current on the rare occasions I use a baseball glove now, one was a Reggie Jackson, and he retired the year I got it. I agree with philo65’s comment, this entry is as creative as McAullife’s batting stance. Only remember him vaguely, and that was as a Tiger. Josh, regarding Mo Vaughn, he actually broke the record first then was passed by Bagwell. Interesting note about Mo and Bagwell. They both came up in ’91 and by the end of ’99 they each had exactly 263 taters. I may be remembering this wrong, but Mo (with immortal Scott Cooper helping) is the main reason Bagwell was traded away by the Sox. With Cooper and Mo coming up to take over the corner infield positions, the Sox felt okay about letting Bagwell go. For a few seasons Mo held his own against Bagwell before the comparison became a bit of a mismatch. But I do remember how excited I was (and everyone was) about Mo coming up to the big leagues, so I can’t squawk much about Bagwell getting away. Maybe the regionality makes sense as ‘rivalries’ were not as intense as they seem to be now. Do kids today turn down a glove with the signature of a hated rival on it? Marty Marion nickname according to baseball-reference.com Slats or The Octopus. Figures. His glove felt like a piece of wood. At the time of the Bagwell trade, Butch Hobson was the manager at the minor leagues’s Double A New Britain Red Sox. Hobson, in consecutive seasons, had just coached Scott Cooper (the golden boy) and Bagwell at New Britain. Hobson told the GM Gorman? that Bagwell was a much better prospect than Cooper and that they should deal Cooper rather than Bagwell. The Astros wanted Cooper for Larry Anderson, but the Red Sox said no and offered Bagwell, and the rest is history. I remember seeing those Hobson-led New Britain Sox. We were following our U of Maine pal Jeff Plympton around the minors and stopped in. I remember Cooper looking like a great player and Bagwell looking kind of awkward, both in the field and at the plate. Vaughn was ultra-impressive, though. The thing I remember most about the game was that the Sox made several fielding miscues during the game and Hobson made them take infield AFTER the game, so we stuck around and watched. The players were not happy. I just noticed the 1974 series does not have the standard player autograph on it. How many years did not have player’s signatures?